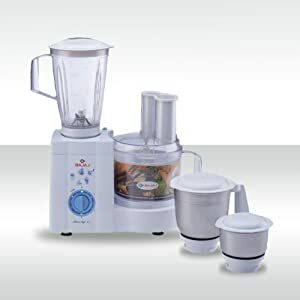 Hassle free cooking is no longer a dream when you use the Bajaj (MasterChef 3.0) 600 W Food Processor. Made from ABS plastic, this food processor is both strong as well as lightweight. 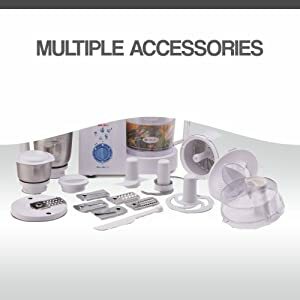 The food processor comes with 3 speed setting for customized food processing. The processor features a 3 speed setting for momentary operation. 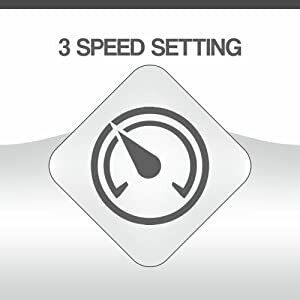 It has a speed selector knob that can be used to control the speed of the processor enabling the user to get the exact consistency as per their desire. The processor accompanies a set of three jars and a processing bowl for varied use. 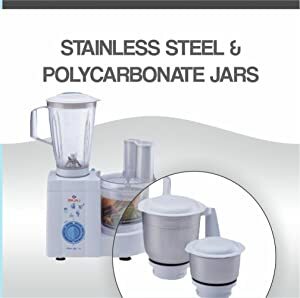 The Grinding jar and the chutney jar are made of stainless steel while the liquidizing jar and processing bowl are made of unbreakable polycarbonate material. 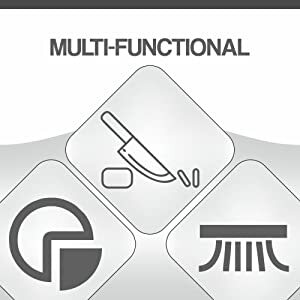 Bajaj Master Chef 3.0 can perform multiple functions for you. Chop, slice, shred and grate all your vegetables and other food items with ease. You can whip creams for cakes and pastries, and prepare delicious batters, purees and chutneys with the multiple processing jars available. 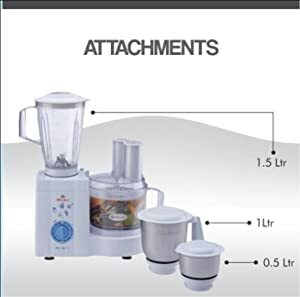 The processor accompanies multiple attachments which includes set of three jars of varied capacities viz-a-viz, 1.5 ltr liquidizing jar, 1 ltr dry grind jar, 0.4 ltr chutney jar and a processing bowl. 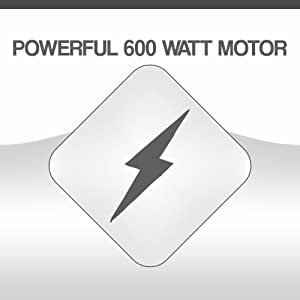 The Bajaj food processor consumes around 600 watts of power to function efficiently. It is capable of grinding hardest of fruits easily & quickly. Featured with multiple accessories, the processor can is a perfect kitchen companion. The accessories include Egg Whisker, Centrifugal Juicer, Atta Kneader, Chopping Blade, Citrus Juicer & Processing Blades to perform fine & coarse shredding, slicing and making French fries or finger chips. Bajaj Electricals Limited (BEL), a globally renowned and trusted company, with a turnaround of ₹4298 crores (FY 16-17), is a part of “Bajaj Group”. 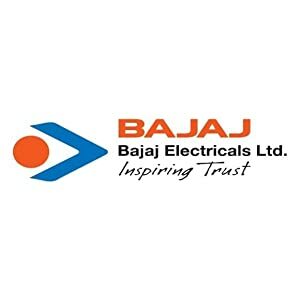 Bajaj Electricals business is spread across – Consumer Products (Appliances, Fans, Lighting), Exports, Luminaires and EPC (Illumination, Transmission Towers and Power Distribution). We also have a presence in the hi-end range of appliances with brands like Platini and Morphy Richards in India.